Habitat: It grows in the Mattoral xerophilo, pastizal and open juniper-pinion forests. These areas support succulents and xerophytes plants such as Opuntia robusta, Opuntia streptacantha, Opuntia tunicata, Opuntia scheeri, Ferocactus histrix, Ferocactus latispinus, Thelocactus bicolor, Echinocereus cinerascens, Parkinsonia aculeata, Myrtillocactus geometrizans, Coryphantha erecta, Coryphantha radians, Acacia farinosa, Ipomoea arborescens, Echinocactus platyacanthus, Echinocactus horizonthalonius, Larrea tridentata, Echeveria secunda and Dasylirion acrotichum. Description: Stenocactus dichroacanthus is one of the many geographical form of the widespread and morphologically very variable Stenocactus crispatus. Many of its morphological and geographical variant was early classified as different independent species, but nowadays all this plant are considered part of a multiform species, where each form is linked to others by populations of plants with intermediate characteristics. Stenocactus dichroacanthus typically has 3 strong flattened central spines and 4-6 glassy-white radial spines. Habit: It is a solitary plant (or rarely branching). Stem: Obovoid up to 15 cm tall, 10 cm wide, somewhat umbilicated at apex, yellowish green, bluish-green, dark matt green or dark olive-green. Ribs: (25-)30-60(-80) thin, acute, very regularly and attractively waived and depressed in the region of areoles. The flattened, wavy or curled ridges of this species are characteristic of other kinds of Echinofossulocactus. Areoles: Only a few in each ribs, white tomentose in youth, later naked. Central spine: 2-3 very flattened, purplish, directed upwards, ferocious-looking, straight or curved, unequal with one very long. Radial spines: 4 to 6 glassy-white. Flowers: Several at a time at plants apex, rather small, 2-4 cm long, funnel-shaped. Perianth segments in two series, pale pink with a purplish midrib, oblong-linear, acute. Flower tube well developed, covered with imbricating scales. 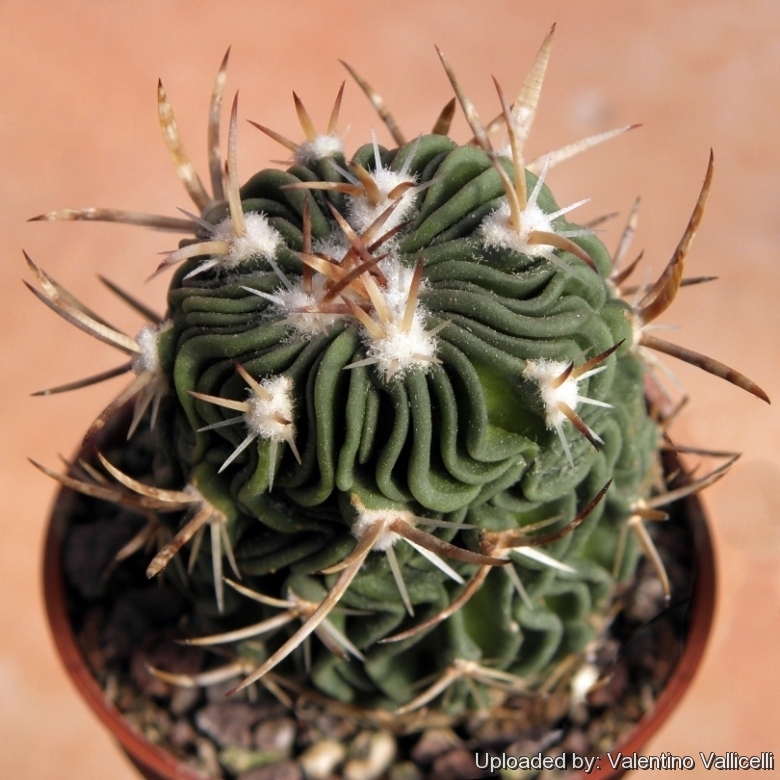 Cultivation and Propagation: Stenocactus dochroacanthus is easy to to care cactus, recommended for any collection that needs lots of light with ample airflow.